Over the next several years, China is likely to influence “third generation” nuclear power more than any other country. That is partly because China already is and will likely continue to be the largest market. It is also because China has the most active efforts at nuclear design, manufacturing and construction. China’s nuclear fleet: Before 1994, no nuclear power operated in China. China never built “first generation” nuclear-power plants or any power plants with “boiling water” reactors. During 2016, 34 “second generation” nuclear-power units are or will be in full, normal operations at 11 power plants in China. Organizations primarily responsible for construction have been China National Nuclear Corporation (CNNC) of Beijing–5 plants and 15 units–and China General Nuclear Power Group (CGN) of Shenzhen–6 plants and 19 units. Click Here for a table of China’s nuclear power-plant units in full operation during 2016: plant and province, unit number, rated net MW, equipment type and source, year and month in full operation, builder organization. CNNC worked with several types and sources of equipment designs. CGN concentrated on a single type, first sourced from France. After building four units, CGN localized the type to China, with increased output, as the CPR-1000 design. That became the major nuclear-power design in China, built by CNNC as well as by CGN and representing 19 of the 34 units operating in 2016. The first CPR-1000 unit at Ling Ao in Guangdong province took 6-1/2 years to build. More recent CPR-1000 units have been completed in a little over 4 years, with about 90 percent of the value sourced from China. The capacity goal was silently ignored. China’s net rated nuclear generation capacity at the start of 2015 totaled only 20 GW–half the claimed goal. No clear public statement came from China’s government reflecting the nuclear safety review. There was little chance of a candid assessment amid a command economy and regimes long arrogant toward the people of China. Because disclosing information outside official channels is harshly punished, China’s regulation of its nuclear industry is far less effective than even United States regulation in 1974, before dissolving the former Atomic Energy Commission and starting the Nuclear Regulatory Commission. Some changes began with retirement of Hu Jintao as general secretary in the fall of 2012 and succession of Xi Jinping. During the Hu regime, China promoted pell-mell industrial growth at the expense of infrastructure and environment. Energy production gorged on China’s coal and led to large coal imports. Motor vehicle traffic grew apace, combining exhaust fumes with coal smoke to produce intense storms of air pollution–sometimes worse than Pittsburgh in the 1940s but enormously larger. Regime change: Near the start of the Xi regime, the Chinese government lifted the moratorium on nuclear authorizations and quickly moved to consolidate and spur activities of nuclear organizations. Owing to needs for large sources of capital, these are all effectively arms of government–regardless of charters. 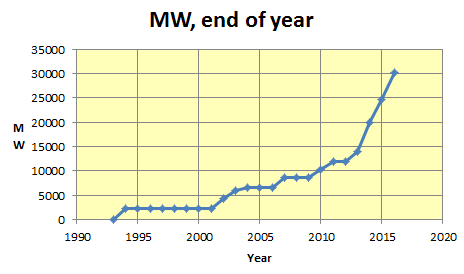 A modest growth in nuclear-power capacity became a surge. More than half the nuclear generation capacity at the end of 2016 will have begun normal operations within the latest three years. A practical effect in China of the nuclear catastrophe in Japan was to accelerate “third generation” nuclear-power technology, in hopes it would deliver on claims of safety yet to be proven through operating experience. Plans for “second generation” units were cut back and new plans for “third generation” units pushed forward. China had already contracted to build four AP-1000 units at Sanmen and Haiyang, mostly designed at Westinghouse in the United States, and two EPR units at Taishan, mostly designed at Areva in France. China had licensed Rev. 15 of AP-1000 designs from Toshiba of Japan–omitting aircraft impact resistance and rejected for U.S. plants, which use Rev. 19 of AP-1000 designs. Chinese organizations apparently saw EPR technology as less promising and had not licensed it from Areva of France. In a reversal of usual behaviors, typically more proactive CGN had taken responsibility for EPR technology, while CNNC took responsibility for AP-1000 technology. Nevertheless, CGN moved rapidly toward a Chinese localization of “third generation” nuclear-power technology using AP-1000 rather than EPR as a model. The overall approach appears to wrap protective AP-1000 “third generation” elements around CPR-1000 “second generation” designs–the latter adapted and promoted by CGN but also utilized by CNNC. For a time, CNNC and CGN elaborated separate, competitive approaches to integrating AP-1000 “third generation” nuclear technologies into Chinese “second generation” designs. Both organizations had built locally sourced “second generation” nuclear units at multiple power plants. In early 2014, China’s government directed the two organizations to produce a single design. They soon began to refer to the object of the joint effort as the 华龙 Hualong (grand China dragon) design. Disputes over still separate elements of plans were resolved by reviewers assembled by Hualong International Nuclear Power Technology Company, a 50-50 joint venture of CNNC and CGN begun in March, 2016. Bloomberg News reported in early August, 2016, that CNNC elements were chosen over those from CGN. The organization will seek overseas business. Its 1.09 GW nuclear-power design has been designated HPR-1000. Geographic regions were separated for CNNC versus CGN activity. CGN, now focused on Guangxi, Guangdong and parts of Fujian provinces, will pursue opportunities in Europe. CNNC will seek overseas business in South America. CNNC asserts that the HPR-1000 “design concept and technologies…have been verified” by “natural science.” That sounds like an appeal to magic. By comparison with the United States and the European Union, regulatory review in China has been, at best, extremely hasty. News sourced from China shows foundations being built for the first HPR-1000 unit in May, 2015, before organizing joint management and more than a year before resolving design issues. In telling contrast, U.S. regulatory review for the AP-1000 design took from March, 2002–when the first complete design was submitted–through December, 2011. No construction occurred during that interval. Developing technology: The HPR-1000 design is not a knockoff of the AP-1000 design, although it uses similar approaches and has nearly the same external ratings. Obvious differences include these five. (1) AP-1000 has a water reservoir for passive cooling on the roof of its containment building; HPR-1000 has a water reservoir inside its building. (2) AP-1000 has two “loops”–steam generators; HPR-1000 has three. (3) AP-1000 has four coolant pumps moving reactor water through its steam generators; HPR-1000 has three. (4) AP-1000 has a core with 157 fuel assemblies, each 264 rods that are 15.0 ft long; HPR-1000 has a core with 177 fuel assemblies, each 264 rods that are 12.7 ft long. (5) AP-1000 has a vessel with 13.3 ft diameter around the core; HPR-1000 has a vessel with 14.4 ft diameter around the core. The HPR-1000 design leverages China’s infrastructure built around the CPR-1000 design, by far its most widely applied nuclear-power technologies. Chinese type AFA3G fuel assemblies have become its high-volume nuclear fuel, required by the CPR-1000 units. Type CF3 fuel rods for HPR-1000 assemblies are slightly (15.9 mm) shorter than type AFA3G rods for CPR-1000 assemblies and use a double-welding process. Dimensions of reactor vessels and steam generators nearly match, assuring that current manufacturers will be able to build them. China’s nuclear industries remain plagued by lack of consistent standards for dimensioning, measuring, testing, inspection and qualification. Instead of adopting or developing a comprehensive set of standards, China continues to apply multiple standards copied from the countries that have been sources for equipment. Those include France, Russia, Canada, the United States, Japan and Spain. A document from China’s National Nuclear Safety Administration suggests that the French RCC-M code (Règles de Conception et de Construction des Matériels Mécaniques) may be the most common standard, because it was used for the CPR-1000 design. When foreign standards are revised–a frequent occurence–it is unlikely that the forest of Chinese copies can be kept synchronized. Over time, that can become a potential source of equipment failures. Energy context: During 2015, China’s nuclear-power fleet produced about three percent of China’s net electricity. So far, growth in nuclear electricity is far outpaced by growth in coal-fired electricity. Between 2014 and 2015, a rated 6 GW of nuclear capacity was added, while a rated 72 GW in coal-fired capacity was added. At recent rates of change, China might never achieve the current world average of about 11 percent nuclear electricity. Quoting from China’s National Bureau of Statistics, Energy Post–produced in the Netherlands–finds that renewable electricity has been growing faster. Between 2014 and 2015, China reported adding about 33 GW, peak in wind capacity and adding about 18 GW, peak in solar capacity. Discounted by typical capacity factors of 90 percent for nuclear, 25 percent for wind and 12 percent for solar, China reported adding about 5.4 GW in average nuclear capacity and about 10.3 GW in average renewable capacity. There has been no information on China’s internal energy development costs that is generally regarded as reliable. This entry was posted in Business, Environment, History, Information, Public health on September 9, 2016 by Craig Bolon.